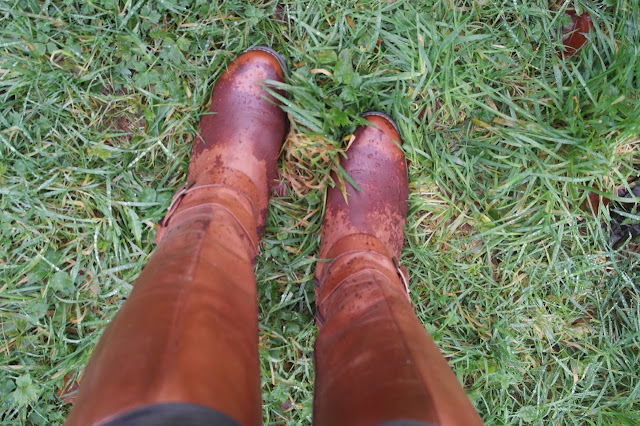 I picked one of the wettest days this week to try out the waterproof claims of the Hush Puppies tan boots I was sent recently. It seems like every other day we're getting torrential rain and high winds - these photos are from New Year's Day where we decided to test the saying 'there's no such thing as bad weather - just inappropriate clothing'..it poured throughout our walk - though you'd never guess from the photos. 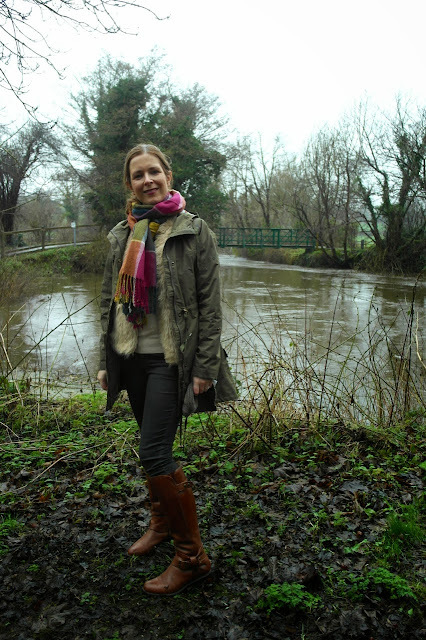 This was the River Lagan just about to burst its banks behind me - it was amazing to see it so high. 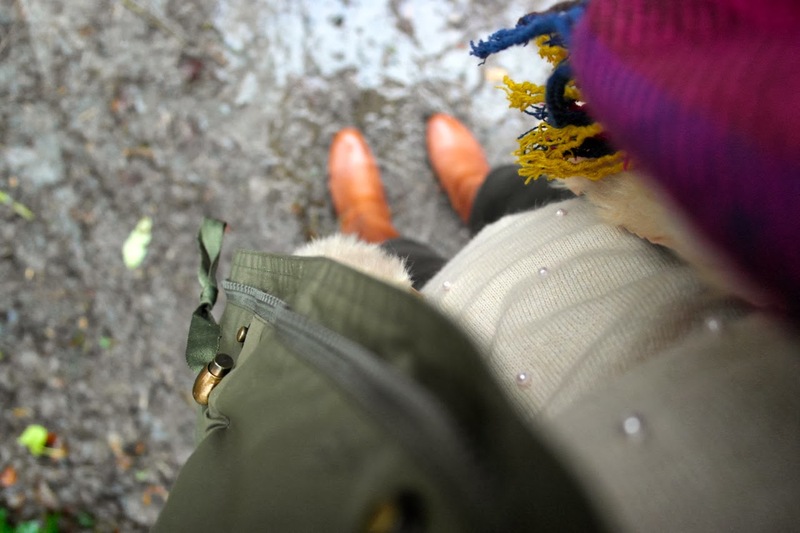 I layered up as the Target Dry Emily Parka is a lightweight coat. So underneath, I have a fur gilet and an embellished jumper. Also wearing the Cosy Checked Scarf from my own shop and coated skinnies (good in the rain!) from Zara. Love the colour but they are a dreadful fit and need a belt and a good old 'hoik' every half hour or so. They've really put me off Zara jeans. So here we are half way in - I'm properly trying these boots out - there were puddles galore. Katie is in this next photo with me wearing her Target Dry rainsuit - she had great fun jumping in the muddy puddles! And here I am at the end of the walk. Now at one stage, I had to wade through a deep section where a stream covered the pathway - you can see the watermark on the bridge of my foot. Not a drop went inside the boot and by the time I got home, the darker leather was back to normal with no marks. But the over-riding thing that impressed me most was how cosy my feet were. I have really cold feet and hands and typically, when I'm out walking this time of year, my feet go numb. Not here - my feet were toasty warm. I was seriously impressed. Obviously, they are not meant for wading through streams. But I reckon what I put them through over an hour of walking through mud, puddles and a muddy, soaking field of wet grass is about as bad as it's going to get on the school run. These boots are going to get some wear this winter. More boot blogging to come as I share with you my UGG story - it's almost ready to publish - as is my January Sale Essential Number 2! I hope you've been having a lovely weekend. Impressive! I don't think UGGs would reap the same results! Thanks for sharing your review. Waterproof leather boots are so hard to find. Same in Hampshire, rain and wind every single day for weeks. Floods everywhere. Went out for a run today as it was dry (& sunny!) this morning - there were loads of people out & about walking dogs, running, just wandering about all bundled up like you making the most of such a rare dry day. It's getting very tiresome now I'm sure you'll agree!! Hi Avril....a very happy New year to you and the family....missed your posting over the holidays! They are lovely boots and good to know the leather held up in such bad conditions! More of that awful weather on the way I hear!! 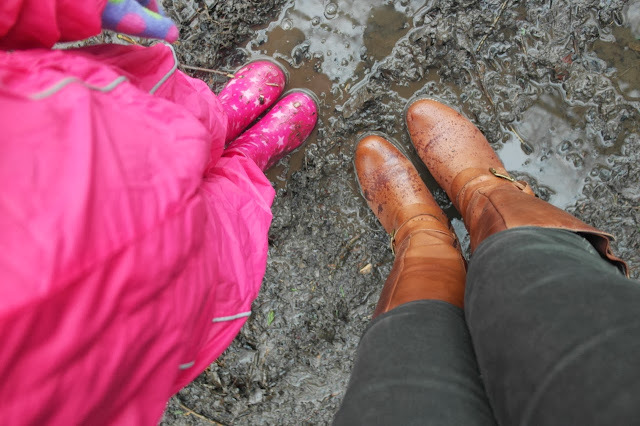 I think you were incredibly brave to put them through what you did - walking through puddles like those in leather boots! But they passed - well done them. They're a fab alternative to wellies! Love these tan boots. And waterproof? Bonus. I am on the hunt for some new boots for weekend wear, so I'll check out Hush Puppies. they hold up the rain but do you think that they can resist to a big puddle over the ankle ? did you ever try them in big puddles ?